The expression for normal eyesight (or 6/6 in countries where metric measurements are used). This notation is expressed as a fraction. The numerator (1st number) refers to the distance you were from the test chart, which is usually 20 feet (6 meters). The denominator (2nd number) denotes the distance at which a person with normal eyesight could read the line with the smallest letters that you could correctly read. For example, if your visual acuity is 20/100 that means that the line you correctly read at 20 feet could be read by a person with normal vision at 100 feet. The Snellen chart, which consists of letters, numbers, or symbols, is used to test visual acuity (sharpness of eyesight). A refraction test is used to determine the amount of correction needed for a prescription when treating refractive error such as astigmatism, myopia, or hyperopia. See ‘Refraction Test’. In vision, ablation refers to the surgical removal of eye tissue to correct a refractive error such as myopia. Measured in prism diopters/diopters the convergence response of an individual (amount the eyes turn inward) in relation to the amount of stimulus of accommodation (eye focusing). The normal ratio is 4:1. The eye’s ability to adjust its focus by the action of the ciliary muscle, which increases the lens focusing power. When this accommodation skill is working properly, the eye can focus and refocus quickly and effortlessly, which is similar to an automatic focus feature on a camera. The ciliary muscles must contract to adjust for near vision, which causes the eye’s crystalline lens, which is flexible, to be squashed. For distant vision, the ciliary muscle must relax and the eye’s crystalline lens is stretched out. The ability of the eye to accommodate does decrease with age due to the crystalline lens becoming less flexible causing a condition called presbyopia. (See “Presbyopia”). This clinical condition is also called accommodative spasm. It is an over focusing, over stimulation of the focusing action of the crystalline lens causing an inability to relax the focusing system which may result in blurry vision when focusing at distance objects. Other symptoms include holding near work closer than normal, headaches with near work (such as reading or using a computer), eyestrain associated with near work, and possible double vision. Clinical signs include: patient accepts more minus on accommodative rock but blurs with plus lenses, lower NRA than PRA, dynamic retinoscopy findings indication of over accommodation and/or slow relaxation of accommodation, and reduced or erratic distance visual acuity. Treatment includes a low plus lens and/or vision therapy. This clinical condition is also called Ill-Sustained Accommodation. It is the inability of the eye to adequately sustain sufficient focusing over an extended time period. The most common sign or symptom is blurred vision after prolonged near work such as reading and using a computer. In addition, such patients often have asthenopia (eyestrain), general fatigue, headaches and nausea, excess tearing, and an unusual sensitivity to light. Clinical signs include: normal amplitude of accommodation, decreased PRA, and the patient generally fails the +/-2.00 D flipper test. Plus lenses (glasses or contacts) and vision therapy are effective in treating this condition. A clinical condition in which the individual has difficulty changing eye focus from distance to near. Symptoms include eyestrain associated with near work (such as reading or using a computer), periodic blurring of distance vision especially following sustained near visual work, tendency to hold near work closer than expected, headaches with near work, and possible double vision. Clinical signs include: patient will have difficulty with both the plus and the minus lens (fails +/- 2.00 D flipper test), low PRA and NRA, and poor recoveries on Bell Retinoscopy. Vision therapy is an effective treatment option. This clinical condition is also called non-presbyopic accommodative insufficiency. It is an under focusing, a lack of focusing ability at a near distance. Symptoms include eyestrain, blurred vision, occasional or constant when doing near work (such as reading or using a computer), occasional unusual sensitivity to light, excess tearing, headaches, and general fatigue. Clinical signs include: patient will have difficulty with a minus lens, low amplitude of accommodation, low PRA and higher NRA. Vision therapy is an effective treatment option. The eye’s ability to still see an image during eye blinks and even after the viewed object is no longer present. The most common example is seeing light after the flash of a camera. Procedure in which a surgeon cuts the cornea so that is more spherical when it heals, thus reducing astigmatism. Proper fusing (uniting) of images to each eye. (clinical condition) Reduced visual acuity (poorer than 20/20) which is not correctable by glasses or contacts and is not caused by structural or pathological anomalies. This condition is often called ‘lazy eye’ because it is typically the result of disuse. It is usually marked by blurred vision in one eye and favoring one eye over the other. About two percent of the population is affected. Any optical error such as hyperopia, myopia, or astigmatism. Also called refractive error. Disorder characterized by the gradual loss of central vision due to a damaged macula (which is made up of retinal cones necessary for sight). A measurement of the eye’s ability to focus clearly on objects at near distances. This eye focusing range for a child is usually about 2-3 inches. For a young adult, it is 4-6 inches. The focus range for a 45-year-old adult is about 20 inches. For an 80-year-old adult, it is 60 inches. Angle In glaucoma refers to the drainage channel for the aqueous humor in the eye; improper drainage can lead to the high intraocular pressure associated with glaucoma. In narrow-angle glaucoma, the channel is blocked, whereas open-angle glaucoma has other causes, such as the body producing too much aqueous humor. A difference in the size or shape of two visual images when the images should be the same size and/or shape. The condition in which the two eyes have different refractive powers. A type of retinal projection, occurring frequently in strabismus, in which the foveae (center of the retina that produces the sharpest eyesight) of the two eyes do not facilitate a common visual direction; the fovea of one eye has the same functional direction with an extrafoveal (non-fovea) area of the other eye. The American National Standards Institute’s Practice for Occupational and Educational Eye and Face Protection; eyewear that meets this standard is considered safer than eyewear that does not. Part of the eye behind the cornea and in front of the iris and lens. Substance that inhibits oxidation and can guard the body from the damaging effects of free radicals. Molecules with one or more unpaired electrons, free radicals can destroy cells and play a role in many diseases. Antioxidants may help prevent macular degeneration and other serious eye diseases. Thin layer(s) applied to a lens to reduce the amount of reflected light and glare that reaches the eye. A stick-like instrument used in vision therapy to develop convergence and divergence (eye teaming) skills. Clear fluid in the eye that both provides nutrients and determines intraocular pressure. Individual who is licensed optometrist for at least two years and provides developmental and behavioral vision care services including vision therapy. Associate members must obtain at least 10 hours of continuing education annually in functional / developmental/ behavioral / rehabilitation vision care. The optometrist has not sat for his/her certification exams, therefore is not Board Certified in Vision Development and Therapy. Eyestrain, symptoms include excessive tearing, itching, burning, visual fatigue, and headache. It can be caused from an uncorrected refractive error, accommodation (eye focusing) disorder, binocularity (eye teaming) disorder, or by extended, intense use of the eyes. Light rays entering the eye do not all meet at the same point (similar to a frayed string), which results in blurred or distorted vision. An abnormally shaped cornea typically causes this condition. Occasionally astigmatism exists in the lens of the eye. This condition is corrected by a cylindrical (toric) eyeglass or contact lens. Also called auto refractor. This method determines the eye’s refractive error and the best corrective lenses to be prescribed by using a computerized device that varies its optical power mechanically and prints out the results. The alignment of the len’s cylindrical part; used for correcting astigmatism. This measurement is given in degrees. The values are typically from 90 degrees to 180 degrees. Opacity of the eye’s stroma and Bowman’s membrane. A wedge-shaped lens which is thicker on one edge than the other. The thicker edge (base) is turned down. Prisms bend light (opposite direction from its thicker end) so the base-down prism turns the light upward thus causing the eye to also move up. This prism is used to measure an eye misalignment and/or treat a binocular dysfunction (eye teaming problem). Prisms are sometimes added to glasses to help improve eyesight due to a misalignment or visual field loss. A wedge-shaped lens which is thicker on one edge than the other. The thicker edge (base) is turned inward, closest to the nose. Prisms bend light (opposite direction from its thicker end) so the base-in prism turns the light outward (toward the ear) thus causing the eye to also move outward. This prism is used to measure an eye misalignment and/or treat a binocular dysfunction (eye teaming problem). Prisms are sometimes added to glasses to help improve eyesight due to a misalignment or visual field loss. A wedge-shaped lens which is thicker on one edge than the other. The thicker edge (base) is turned outward, closest to the ear. Prisms bend light (opposite direction from its thicker end) so the base-out prism turns the light inward (toward the nose) thus causing the eye to also move inward. This prism is used to measure an eye misalignment and/or treat a binocular dysfunction (eye teaming problem). Prisms are sometimes added to glasses to help improve eyesight due to a misalignment or visual field loss. A wedge-shaped lens which is thicker on one edge than the other. The thicker edge (base) is turned up. Prisms bend light (opposite direction from its thicker end (base)) so the base-up prism turns the light downward thus causing the eye to also move down. This prism is used to measure an eye misalignment and/or treat a binocular dysfunction (eye teaming problem). Prisms are sometimes added to glasses to help improve eyesight due to a misalignment or visual field loss. Used to correct vision at two distances, composed of two ophthalmic lenses such as a plus lens for near vision and a minus lens for distance vision. Visual guidance of body movements and the coordination between both sides of the body. The simultaneous use of the two eyes. The ability to use both eyes as a team and to be able to fuse (unite) two visual images into one, three-dimensional image (See ‘Convergence’ and ‘Divergence’). Condition characterized by crusting around the eyes upon awakening, itching, burning, tearing, swollen eyelids and mucus. Lack of visual clarity or acuity. An injection of this poison has been used as an alternative to conventional surgery in selected strabismic patients. It causes a temporary paralysis of an extraocular muscle that leads to a change in eye position. This change has been reported to result in long-lasting and permanent alteration in eye alignment. Although one injection is often sufficient to produce positive results, one-third to one-half of patients may require additional injections. This technique has been most successful when used in adults with small-angle misalignments. It is not commonly used in children. This treatment is also used in patients who have blepharospam (an uncontrollable eye lid spasm). Corneal layer between the epithelium and the stroma. The point at which a person can no longer fuse (unite) two images into one. A blur point will occur before the this point. An instrument used in orthoptics/vision therapy to improve eye teaming skills and near focusing skills. It consists of two parallel viewing tubes with a +5.00 D lens. The distance from the target can be adjusted as well as the pupillary distance. The Bernell-O-Scope and Keystone Ophthalmic Telebinocular are designed essentially the same. The part of eyeglasses that extends across the nose. Style of eyeglasses that wraps around the ear, to keep them well-fastened. A condition of the crystalline lens, in which the normally clear lens becomes clouded or yellowed, causing blurred or foggy vision. Cataracts may be caused by aging, eye injuries, disease, heredity, or birth defects. Surgery is a treatment option. The affected lens is removed and is replaced with a substitute (implant) lens or with a special type of contact lens. Generally the success rate of cataract surgery is over 90%, if the eye is otherwise healthy. Refractive surgery complication in which the laser leaves an “island” of corneal tissue in the concave ablation zone. Symptoms include double vision and distortion. An instrument used in orthoptics/vision therapy to train binocular skills and accommodation skills. The Keystone Correct-Eye Scope is an example of a Cheiroscope. Layer of blood vessels and pigments (usually brown or blue) that lies beneath the sclera (the white of the eye). Often mistakenly called the iris. A structure directly behind the iris of the eye and contains the ciliary muscle. A band of muscle and fibers that are attached to the lens that controls the shape of the lens and allows the lens to accommodate (change focus). Serious eye infection usually found in those with immune problems, such as AIDS patients; symptoms include floaters, blind spots, blurry vision and vision loss. Fibrous protein in bones and connective tissue, it is also present in the eye. One type of vision correction surgery heats collagen around the edges of the cornea (which lets light into the eye). This procedure reshapes the cornea, helping it focus light right onto the retina, for clearer vision. A test that measures the ability to identify and distinguish colors. Also known as Colorblindness. It is the absence of or defect in the perception of colors. Color vision is based on perception of red, green, and blue. If there is a defect in the perception of one of these colors, a color will be perceived as if it were composed only of the other two colors. Based on the color or colors for which there is defective perception, a person may suffer from red, green, or blue blindness. Color blindness in which all colors are perceived as gray is termed monochromasia. For people with the common, inherited, types of color deficiency there is no cure. A condition in which the magnitude of deviation remains essentially the same in all positions of gaze and with either eye fixating. The complex of eye and vision problems related to near work that are experienced during or related to computer use. Its symptoms include eyestrain, dry or burning eyes, blurred vision, headaches, double vision, distorted color vision, and neck and backaches. The condition is caused by various internal and external factors. Treatment options may include prescription glasses and/or vision therapy. Procedure wherein a surgeon uses radio waves to heat collagen in the cornea’s periphery to shrink it and reduce hyperopia. A receptor cell which is sensitive to light and is located in the retina of the eye. It is responsible for color vision. Mucous membrane that lines the visible part of the eye and the inner surface of the eyelid. An inflammation of the conjunctiva, the transparent layer covering the inner eyelid and the white portion (sclera) of the eyeball. Conjunctivitis can be caused by a virus, bacteria, or fungus (infectious conjunctivitis, or “pink eye”, may be contagious); by allergies to pollen, fabrics, animals, or cosmetics (allergic conjunctivitis); or by air pollution or noxious fumes such as swimming pool chorine (chemical conjunctivitis). Symptoms include red or watery eyes, blurred vision, inflamed inner eyelids, scratchiness in the eyes, or (with infectious conjunctivitis) a puss like or watery discharge and matted eyelids. Conjunctivitis is usually treated with antibiotic eye drops and/or ointment. The ability to use both eyes as a team and to be able to turn the eyes inward to maintain single vision up close. (clinical condition) the inability of the eyes to turn inward and/or sustain an inward turn. Symptoms include eye strain with reading and using a computer, headaches, loss of comprehension, difficulty concentrating, blurred or double vision, and eye fatigue. Clinical signs include: near point of convergence of greater than 4 inches (10 cm), greater exophoria at near than at distance, and low AC/A ratio. Vision therapy is an effective treatment option. The transparent, blood-free tissue covering the central front of the eye (over the pupil, iris, and aqueous humor) that initially refracts or bends light rays as light enters the eye. Contact lenses are fitted over the cornea. Tearing or puncture of the cornea. Usually causes pain, tearing, light sensitivity, and a feeling that something is in the eye. Devices (such as rings or contacts) placed in the eye, usually to correct vision. Type of vision correction surgery where a doctor inserts a tiny plastic ring into the cornea (which lets light into the eye). This ring reshapes the cornea, helping it to focus light better onto the retina so you can see better. The ring can be adjusted and even removed if desired. Process of using a camera/computer system to map the cornea for refractive surgery, contact lens fitting and corneal disease management. Wound in the surface of the eye caused by injury, dryness due to lack of tear production, or infection. A test of eyeball alignment in which each eye is covered with an occluder (eye cover) and then uncovered to observe eye movements. Certified Optometric Vision Therapy Technician To be certified an individual must be employed by a Fellow (FCOVD), provide documentation of 2000 hours or 2 years of direct clinical experience in vision therapy; or 1000 hours of clinical experience if the individual holds an AA degree or higher with emphasis in the behavioral sciences. Submit written answers to a series of Open Book Questions dealing with various aspects of vision function, testing and therapy. Pass an extensive written and oral examination evaluating the candidate’s knowledge and clinical abilities in behavioral vision, vision development and vision therapy. COVTTs must obtain at least 6 hours of continuing education annually in functional / developmental / behavioral vision care. Transparent disc located behind the iris which changes shape to focus on objects at different distances from the eye. Swelling of the eye’s macula, caused by an excessive amount of fluid. Blocked tear duct, which is characterized by a lot of tearing. Corneal layer between the stroma and the endothelium. When a delay in an individual’s normal development has occurred. 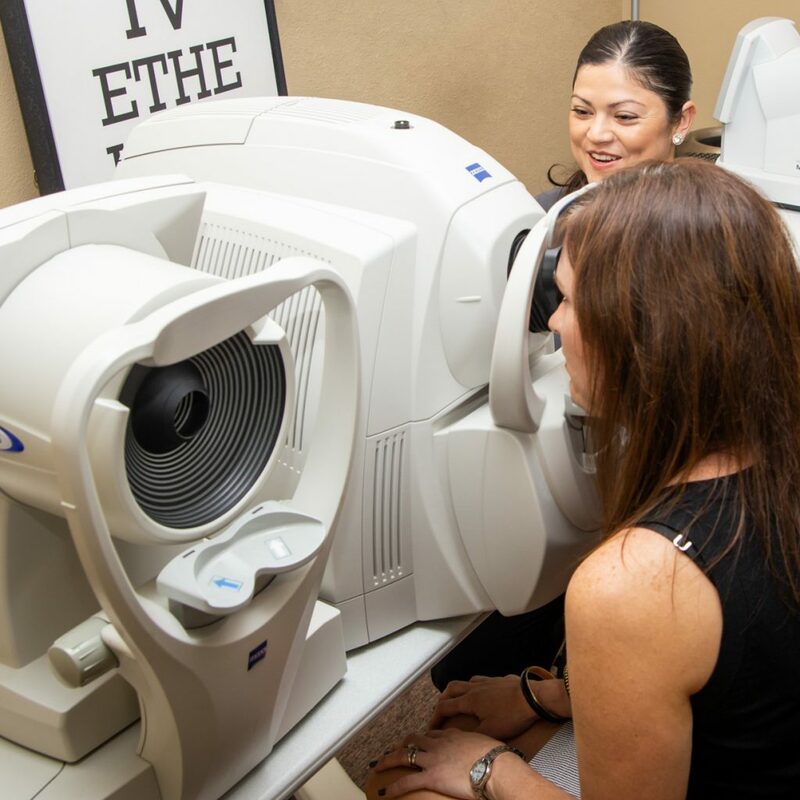 More comprehensive than a routine eye exam, examination will evaluate all of the patient’s visual abilities such as visual acuity, eye focusing skills, eye teaming skills, eye tracking skills, visual motor skills, and visual perceptual skills. Leaking of retinal blood vessels in advanced or long-term diabetes, affecting the macula or retina. Vision can be seriously distorted or blurred. A measurement of the refractive (light bending) power of a lens or a prism (pd). The strength of prescription glasses and contacts are measured in these units. For example a lens that is 0.50 diopter (D) is very weak, where as a lens that is 10.0 diopter (D) is very strong. A single object is perceived as two rather than one; double vision. Directionality relates to the awareness of the relationship of one object in space to another / laterality relates to the internal awareness of the two sides of the body. Directionality/Laterality can also be called spatial relations. A condition in which an individual has poor development of left/right awareness. Symptoms of this disorder include confusion of right and left direction and letters and/or numbers reversals. Vision therapy is a helpful treatment option. The eye’s ability to distinguish an object’s shape and details at a far distance such as 20 feet (6 meters). The ability to use both eyes as a team and be able to turn the eyes out toward a far object. (clinical condition) The eye’s tendency to drift out relative to the direction of a distant object being viewed. Symptoms include: double vision at distance, headaches, eyestrain, nausea, dizziness, and blurred vision. Clinical signs include: exophoria greater at distance than near, high AC/A ratio, and reduced positive fusional vergence at distance. Can be improved with vision therapy. (clinical condition) The eye’s tendency to turn more inward than necessary when viewing a distant object. Symptoms include: double vision, headaches, eyestrain, nausea, dizziness, and blurred vision. Clinical signs: esophoria greater at distance than near, low AC/A ratio, and reduced negative fusional vergence at distance. Treated with corrective lenses and vision therapy. The eye that “leads” it partner during eye movements. Humans also have dominant hand, foot, eye, and side of the brain (not necessarily all on the same side). Small yellow or white deposit in the eye. Drusen are sometimes signs of macular degeneration. Lack of sufficient lubrication and moisture in the eye. Most dry eye complaints are temporary and easily relieved; dry eye syndrome is chronic and needs more advanced treatment by an eyecare practitioner. A test of the eye’s ability to turn inward or outward while maintaining single, binocular vision with the gradual introduction of progressively stronger base-in or base-out prisms. Inability to “sound out” words and poor sight recognition of words. Dysphoneidesia is a subtype of dyslexia. Its characteristics are a combination of the other two forms of dyslexia: Dysphonesia and Dyseidetic. Inability to “sound out” words. Dysphonesia is a subtype of dyslexia. Children with this form of dyslexia have difficulty sequentially analyzing and remembering what and where the sounds are in words. The resulting phonemic processing problems make it difficult to sound out new words, learn phonics, and make them dependent on their sight vocabulary. When they come to an unknown word they will often substitute a word using context clues. For example, “pony” for “horse”, even though the substituted word doesn’t look or sound anything like the original word. When spelling unknown words it is often difficult to determine what the original word is. For example, they may write “fmlue” for “familiar” or “lap” for “lamp”. They cannot learn phonics because they cannot process where the sounds are. Their short term sequential auditory memory can be poor and result in repeating “8167” as “8671”, or remember to go to their room but forgetting to get the item requested. Poor sight recognition of words. Dyseidetic is a subtype of dyslexia. Children with this form of dyslexia have trouble analyzing and remembering written symbols. They continue to confuse the orientation. For example, they will write numbers and letters backwards long after other children have mastered these skills. They often confuse letter sequences in reading, and in spelling often get all the letters but in the wrong sequence (spelling “dose” for “does”, “on ” for “no”, etc.). Their visual memory for words is poor, and after learning a new word they may fail to recognize that same new word later in the sentence. They have trouble learning to read and spell phonetically irregular words. For example, they may read ” laugh” as “log” and spell it as “laff”, both of which are phonetically consistent. Their spelling will have many mistakes, but will be phonetically consistent and one can usually tell what the word was they were trying to spell. When they are attempting to read an unknown word they will usually attempt to sound it out and do so very slowly. A specific language-based disorder. The individual has difficulty with letter or word recognition, spelling, reading, writing, and sometimes naming pictures of objects. Dyslexia varies in degree from mild to very severe. It is caused by an inability of the brain’s language centers to decode print or phonetically make the connection between the word’s written symbols and their appropriate sounds. Dyslexia is not caused by a vision disorder. Children often are of normal or above normal intelligence. Dyslexia cannot be cured and will never be outgrown. Appropriate teaching methods can be taught to help those with dyslexia overcome their weakness. The Dyslexia Determination test which is used by many optometrists who specialize in vision related vision problems investigates if the patient has one of the three forms of dyslexia: Dyseidetic – poor sight recognition of words, Dysphonesia- inability to “sound out” words, and Dysphoneidesia – a combination of characteristics from both types. Vision therapy is NOT considered a direct treatment for dyslexia. The deviating eye does not use the central foveal (center of the retina that produces the sharpest eyesight) area for fixation. Commonly, individuals with amblyopia and some individuals with strabismus will have this visual adaptation. In esotropia, the eccentrically located retinal point used for fixation is usually in the nasal retina. In exotropia, the eccentrically located retinal point used for fixation is usually in the temporal retina. Vision therapy is a treatment option for those with amblyopia and/or strabismus. It is not a treatment option for an individual with a fovea that has been destroyed. Normal vision, no correction needed. (clinical condition) A tendency of the eyes to want to turn more inward than necessary when an individual is viewing an object at near or at distance, which may cause the individual to experience eyestrain and other symptoms. Symptoms of basic esophoria include: eyestrain, headaches, blurred or double vision, apparent movement of print, and difficulty concentrating on and comprehending reading material. Clinical signs of basic esophoria include: AC/A ratio is normal, equal esophoria at distance and near, and normal near point of convergence. Sometimes esophoria is caused by a refractive error such as hyperopia (farsightedness), and glasses or contacts can correct the problem alone. However, sometimes vision therapy is needed to to help re-train the eyes to function more appropriately. The cornea’s inner layer of cells. The cornea’s outer layer of cells. (clinical condition) A condition in which an eye is turned either constantly or intermittently inward toward the nose. Esotropia is a type of strabismus. It is caused by a reduction in visual acuity, reduced visual function, high refractive error, traumatic brain injury, oculomotor nerve lesion, or eye muscle injury. Treatment options may include one or more of the following: glasses or contacts, bi-focal lenses, prisms, vision therapy, surgery, or Botulinum Toxin Type A (Oculinum, BotoxTM) injections. In some cases, esotropia is caused by a refractive error such as hyperopia (farsightedness), and glasses or contacts alone may allow the eyes to straighten. Vision therapy is most appropriate when there are small degrees of misalignment. Surgery, to re-position or shorten the eye muscles, may be required for high degrees of misalignment. If surgery is required, a combination of surgery and vision therapy often yields the best results. (clinical condition) A tendency of the eyes to want to turn more outward than necessary when an individual is viewing an object at near or at distance, which may cause the individual to experience eyestrain and other symptoms. Symptoms of basic exophoria include: eyestrain, headaches, blurred or double vision, apparent movement of print, and difficulty concentrating on and comprehending reading material. Clinical signs of basic exophoria include: normal AC/A ratio, equal exophoria at distance and near, and decreased near point of convergence. Vision therapy is an effective treatment option. The muscles attached to the outside of the eyeball which control eye movement. Each eye has six muscles (lateral rectus, medial rectus, superior oblique, inferior oblique, superior rectus, and inferior rectus) that are coordinated by the brain. The ability of our eyes to guide our hands, also called visual motor integration. (equipment) An electronic testing and recording system of eye movements as in reading. The ability of the eyes to smoothly and effortlessly follow a moving target. Optometrists (O.D.s) and ophthalmologists (M.D.s) both practice eyecare, but in different ways: O.D.s (Doctors of Optometry) examine eyes for both vision and health problems, prescribe glasses, prescribe and fit contact lenses, and treat some eye conditions and diseases. M.D.s are medical doctors who examine eyes, prescribe glasses and contacts, treat disease and perform surgery. Other non-doctor eyecare practitioners include paraoptometrics, contact lens technicians and opticians. A measure of the ease and speed of the eye(s) to change focus. Also called hyperopia. To farsighted people, near objects are blurry, but far objects are in focus. Individual who is a licensed optometrist for a minimum of three years and directly involved in vision therapy for a minimum of 2 years, has completed a guided study program, submitted evidence of 100 hours of continuing education in functional vision (and vision therapy), and passed rigorous written, oral, and clinical examinations. Fellows are Board Certified in Vision Development and Therapy and must obtain at least 15 hours of continuing education annually in functional / developmental / behavioral / rehabilitation vision care. The ability to recognize distinct shapes from their background, such as objects in a picture, or letters on a chalkboard. The ability to coordinate hand and finger movements. The ability to direct and maintain steady visual attention on a target. Fixations are a form of pursuits. Over-convergence or under-convergence, or vertical misalignment of the eyes under binocular (both eyes) viewing conditions small enough in magnitude so that fusion is present. Also known as spots, are usually clouded or semi-opaque specks or particles within the eye that are seen in the field of vision. The eyes are filled with fluid which maintains the shape of the eye, supplies it with nutrition and aids in the focusing of light. Often, particles of protein or other natural materials are left floating or suspended in this fluid when the eye is formed before birth. If the particles are large or close together, they cast shadows which make them visible. This is particularly true when nearsightedness occurs or becomes more severe. In most cases this is normal but floaters can also be caused by certain injuries, eye disease or deterioration of eye fluid or its surrounding structures. The ability to recognize two objects that have the same shape but different size or position. This ability is needed to tell the difference between “b” and “d”, “p” and “q”, “m” and “w”. A convergence response which serves to maintain (fusion) the union of images from each eye into a single image. The eyes will turn with a slow smooth tonic movement or a fast jumping movement called phasic. see “General Binocular Vision Disorder”. The union of images from each eye into a single image. There are three degrees of fusion. 1st degree fusion is the superimposition of two dissimilar targets. 2nd degree fusion is flat fusion with a two-dimensional target. 3rd degree fusion is depth perception (stereopsis) with a three-dimensional target. Determines the eyes ability to unite the images from each eye into a single image. Inability to efficiently utilize and/or sustain binocular vision. Symptoms include eyestrain, headaches, decreased comprehension, inability to concentrate while reading, excessive tearing, and blurred vision. A patient will have difficulty with both base-in and base-out prisms. Vision therapy is an effective treatment option. Disease characterized by excessive fluid (aqueous humor) in the eye, high intraocular pressure and vision impairment. Blindness can result. Thyroid-related, autoimmune eye disorder usually associated with Graves’ disease; symptoms include eyelid retraction, bulging eyes, light sensitivity, discomfort, double vision and vision loss. Tendency of the eyes to deviate from their normal position for visual alignment. This condition may be observed when one eye is covered. The eyes are abnormally turned. Irregularity of the eye other than a refractive error (myopia, hyperopia or astigmatism). Higher-order aberrations sometimes affect your vision (such as decreasing contrast sensitivity), and sometimes do not. Type of lens with a higher index of refraction, meaning that light travels faster through the lens to reach the eye than with traditional glass or plastic. It is denser, so the same amount of visual correction occurs with less material (whether glass or plastic), so the lens can be thinner. A computer program which is prescribed by an eye doctor. The computer program is for improving eye tracking, eye teaming, and/or eye focusing. Farsightedness, an individual will have difficulty seeing clearly up close. Light entering the eye focuses behind the retina when the eye is at rest and is corrected with a plus lens. Vision therapy is not prescribed for hyperopia. Children, up to about the age of 8 years, are often farsighted. A condition in which one eye has a tendency to point higher than the other eye, causing eyestrain. Sometimes improved by prisms in glasses. Strabismus, one eye turned in an upward direction. A condition in which one eye has a tendency to point lower than the other eye. This condition may be observed when one eye is covered. Strabismus, one eye turned in a downward direction. This clinical condition is also called Accommodative Fatigue. It is the inability of the eye to adequately sustain sufficient focusing over an extended time period. The most common sign or symptom is blurred vision after prolonged near work such as reading and using a computer. In addition, such patients often have asthenopia (eyestrain). Clinical signs include: normal amplitude of accommodation, decreased PRA, and the patient generally fails the +/-2.00 D flipper test. Plus lenses (glasses or contacts) and vision therapy are effective in treating this condition. A condition also known as Noncomitant Strabismus. It occurs when the magnitude of deviation is not the same in the different positions of gaze or with either eye fixating. There is an abnormal restriction to movement or an over-action of one or more of the extraocular muscles. Generally, the magnitude must change by at least 5 PD to be incomitant (nonconcomitant). Artificial lens that a cataract surgeon places in a patient’s eye after removing the eye’s natural lens. Like a contact lens, it has a built-in refractive power tailored specifically to the patient’s visual condition. Eye pressure, as determined by the amount of aqueous humor filling it. High IOP (ocular hypertension) can be a sign of glaucoma. The colored part of the eye located between the lens and cornea; it regulates the entrance of light. Surgical removal of part of the cornea. Condition in which the cornea develops a cone-shaped bulge that can result in major blurring and distortion. Any of several types of corneal surgery, such as shrinking the collagen to reduce farsightedness or transplanting a new cornea to treat Keratoconus. The sensation of bodily position, presence, or movement resulting chiefly from stimulation of sensory nerve ending in muscles, tendons, and joints. Device to block the lacrimal punctum (an opening at the end of a tear duct), to keep the eye moist. A measure of the eye’s ability to focus accurately on a given target. The dioptric difference between the eye’s focusing response and the stimulus to focus. Procedure in which a surgeon uses a laser to coagulate tissue, usually to seal leaking blood vessels and destroy new ones in diseases like macular degeneration and diabetic retinopathy. Procedure that is similar to LASIK, except that the surgeon cuts a flap in the epithelium only, instead of through the epithelium and part of the stroma. LASEK is used mostly for people with thin or flat corneas who are poor candidates for LASIK, which requires more corneal tissue for success. Also called Laser Thermokeratoplasty. Surgery to correct mild farsightedness in people over 40; the doctor uses a holmium laser to heat the cornea and shrink its collagen. Surgical procedure in which a tiny flap is cut in the top of the cornea, underlying corneal tissue is removed with an excimer laser, and the flap is put back in place. LASIK corrects myopia and hyperopia. Muscle Muscle that moves the eye away from the nose. A disorder that affects people’s ability to either interpret what they see and hear or to link information from different parts of the brain. Learning disabilities can be divided into five broad categories: speech and language disorders, reading disorder, arithmetic disorder, writing disorder, and attention disorders. The term learning disability does not include children who have learning problems that are primarily the result of visual, hearing, or motor disorders. Also called Verometer, is a device used to measure the refractive power of eyeglasses and contact lenses. Boundary area connecting the cornea and sclera; the three form the eye’s outermost layer. A fatlike substance that can collect on contact lenses, making them uncomfortable. Also called partial sight. Sight that cannot be satisfactorily corrected with glasses, contacts, or surgery. Low vision usually results from an eye disease such as glaucoma or macular degeneration. An antioxidant that is found throughout the body, but is concentrated in the macula. Lutein is believed to help protect the eyes from free radical damage caused by the sun’s harmful rays. The most sensitive part of the retina that is about the size of a pinhead and is where our most detailed vision occurs. Disease of the macula, such as age-related macular degeneration. A deterioration of the central portion of the retina known as the macula. A voluntary or intentional reduction in visual acuity or other examination data. Muscle Muscle that moves the eye toward the nose. Small instrument that surgeons use to cut the cornea. Also called Microtropia, Monofixation Syndrome, and Small Angle Strabismus. A small angle deviation (inward or outward, commonly inward) that is less than five degrees with some amount of stereopsis (depth perception) and anomalous retinal correspondence (ARC). Possible mild amblyopia, eccentric fixation, and/or anisometropia may also be present. It frequently results from the treatment of a larger-angle deviation (esotropia or exotropia) by optical correction, vision therapy, pharmacological agents, and/or extraocular muscle surgery. Treatment for microstrabimus consists mostly of correcting significant refractive errors and any coexisting amblyopia. The use of vision therapy and prisms to establish bifoveal fusion has been successful in selected cases. (ocular) Visual phenomena that may accompany a migraine headache or that may occur without any headache. They include light flashes, spots, wavy lines, flickers, zig-zagging lights, semi-circular or crescent-shaped visual defects and distortions of shapes. Concave lens, stimulates focusing and diverges light. The lens is thinner in the center than the edges. It is used in glasses or contact lenses for people who are nearsighted (Myopia). Only one eye having useful vision. Autoimmune disease sometimes related to thyroid conditions. Signs are droopy eyelids or double vision that worsen toward the end of the day. Nearsightedness, an individual will have difficulty seeing clearly at distance. Light entering the eye focuses in front of the retina when the eye is at rest and is corrected with a minus lens. A condition known as high myopia occurs when myopia is greater than 6 diopters. Typically, vision therapy is not prescribed for myopia. The eye’s ability to distinguish an object’s shape and details at a near distance such as 16 inches (40 cm). Also called myopia. Condition in which visual images come to a focus in front of the retina, resulting in defective vision of distant objects. The closest point at which the two eyes can maintain a single united image. Measures the patient’s ability to point the eyes at an approaching object and to keep them fixed on the object as it reaches the patient’s nose. Normal range is 0 to 4 inches away from the nose. A measure of the maximum ability to relax accommodation while maintaining clear, single binocular vision. Abnormal growth of new blood vessels, such as in an excessive amount, or in tissue that normally does not contain them. Also spelled naevus. Brown pigmentation resembling freckle or mole on white of the eye. More often found in dark-skinned people. Sometimes malignant. Metallic element used mainly in alloys. Many eyeglass frames are made of nickel alloy, so people who are allergic should choose a hypoallergenic substitute, such as titanium. The foveas of the two eyes are corresponding neural points in the visual cortex and binocular vision can occur. Rhythmic oscillations or tremors of the eyes which occur independent of the normal eye movements. Generally nystagmus is not curable, but it is manageable. Treatments include prescription glasses or contact lenses, prisms, and vision therapy. General eye movement ability, which include pursuits (to visually track and/or follow moving objects) and saccades (to direct and coordinate eye movement as the eye quickly and voluntarily shift from one target to another). Condition in which the intraocular pressure of the eye is elevated above normal and which may lead to glaucoma. A physician (doctor of medicine (M.D.) or doctor of osteopathy (D.O.) who specializes in the comprehensive care of the eyes and visual system in the prevention of eye disease and injury. The ophthalmologist has completed four or more years of college premedical education, four or more years of medical school, one year of internship, and three or more years of specialized medical and surgical training and experience in eye care. The ophthalmologist is a physician who is qualified by lengthy medical education, training and experience to diagnose, treat and manage all eye and visual system problems, and is licensed by a state regulatory board to practice medicine and surgery. The ophthalmologist is the medically trained specialist who can deliver total eye care: primary, secondary and tertiary care services (i.e., vision services, contact lenses, eye examinations, medical eye care and surgical eye care), and diagnose general diseases of the body. An ophthalmologist is not trained to provide vision therapy. A device used to illuminate the inside of the eye and enlarge the image for examining the retina, optic nerve entrance, arteries, and veins. Is a bundle of nerve fiber that connects each eye to the brain and transmits images from the retina to the brain. Also called optic disk. Circular area where the optic nerve enters the retina, and the location of the eye’s blind spot. A professional in the field of designing, finishing, fitting and dispensing of eyeglasses and contact lenses, based on an eye doctor’s prescription. The optician may also dispense colored and specialty lenses for particular needs as well as low-vision aids and artificial eyes. A health care professional who is state licensed to provide primary eye care service. These services, include comprehensive eye health and vision examinations; diagnosis and treatment of eye disease and vision disorders; the detection of general health problems; the prescribing of glasses, contact lenses, low vision rehabilitation, vision therapy, and medications; the performing of certain surgical procedures; and the counseling of patients regarding their surgical alternatives and vision needs as related to their occupations, avocations and lifestyle. The optometrist has completed pre-professional undergraduate education in a college or university and four years of professional education at a college of optometry, leading to the doctor of optometry (O.D.) degree. Some optometrists complete a residency. Gradual or sudden loss of central vision (partial loss) affecting visual acuity with no treatment options. * nutritional amblyopia- vision loss caused by low levels of vitamin B12 due to poor nutrition and poor absorption associated with drinking alcohol. * tobacco-alcohol amblyopia- clinical evidence exists that a nutritional deficiency is the underlying cause of this vision loss; however, many still believe that the toxic effects of alcohol and/or tobacco are contributing factors. * toxic amblyopia- caused by exposure to toxins such as ethambutol, methyl alcohol (moonshine), ethylene glycol (antifreeze), cyanide, lead, and carbon monoxide. Procedure in which a doctor fits you with special gas permeable contact lenses to reshape your cornea and correct errors like nearsightedness. Often, patients wear the lenses just at night. The absence of either esophoria or exophoria. The eyes do not have a tendency to want to turn more inward than necessary or want to turn more outward than necessary when pointed on an object. The science of correcting defects in binocular vision. The technique of eye exercises to correct strabismus (esotropia or exotropia), convergence insufficiency (exophoria), or convergence excess (esophoria), amblyopia, and ocular motility disorders. Orthoptics was pioneered by French ophthalmologist Javal in the mid to late 1800’s. Today ophthalmologists use specialty-trained healthcare professionals called orthoptists to evaluate patients and treat them with orthoptics. In America, the non-surgical technique of orthoptics is less commonly used by ophthalmologists compared to other countries. Orthoptics is a limited form of optometric vision therapy. Condition in which the eyes come too far inward when focusing on a near object, resulting in blurring. Small bump where the optic nerve exits the eye. A paralysis that when occurring in ocular muscles causes double vision when looking in some directions. Posterior part of the eye’s ciliary body. To prevent sight out of the good eye and force the weaker, amblyopic eye, to function. A filter, eye patch, or eye drops such as atropin or miotics are used on the good eye. The measurement of a visual field function (the total area that can be seen while looking straight ahead) using targets of different sizes and brightness (light levels). The visual field is measured in degrees. In a normal eye the peripheral field of vision is about 180 degrees. An instrument called a perimeter is used for mapping all areas of a person’s eyesight, including peripheral (side) vision. Visual field testing can help detect certain patterns of visual loss, indicating specific types of eye diseases or vision conditions. It is the single best test for diagnosing glaucoma. Procedure in which a surgeon uses ultraviolet radiation to remove tissue. Able to change lens color or darkness/density depending upon the degree of exposure to light. Surgical procedure in which an excimer laser is used to remove corneal tissue to correct vision problems. Yellowish, thickened lesion on the conjunctiva. May be caused by irritation from sun, dust and wind. A normal diplopia (double vision) that occurs when an individual is not pointing his/her eyes on a certain object. A lens that has no prescription. No variance between the curvature of the front and back lens surfaces. It is a flat lens. Convex lens (thicker in the middle) relaxes focusing and converges light. It is typically used in glasses or contact lenses for people who are farsighted (hyperopic). Although it may also be prescribed for other visual conditions as well. A lens used in sunglasses and sometimes 3D glasses which consists of two glass or plastic surfaces with a plastic lamination between the two surfaces, and designed to reduce reflected glare. In optometric vision therapy, these lens are used with 3D pictures such as vectograms and stereograms, which are also polarized. Lens material that is very impact-resistant, thinner than plastic, and is used for spectacle lenses. Old-fashioned hard contacts were made of PMMA, which is not permeable; today’s rigid lenses contain other polymers that allow oxygen to reach your eye. A measure of the maximum ability to stimulate accommodation while maintaining clear, single binocular vision. Part of the eye behind the iris and in front of the lens. Sometimes called the fourth refractive error, is not truly a refractive error. It is the natural process of the eye losing the ability to accommodate or change the shape of the natural crystalline lens inside the eye to see comfortably at near. This vision defect occurs with the advancement of age; the onset usually occurs between the ages of 40 to 45. Unlike the rest of the body, which stops growing by the age of twenty, the lens of the eye continues to grow throughout life. As the lens ages and grows, it becomes harder in consistency, loses its elasticity, and therefore is resistant to changes in shape. The result is a gradual reduction in accommodation (near eye focus), and a more dependence on reading glasses. A plus lens or multi-focal lens (such as a bifocal lens) is prescribed in the form of glasses or contact lenses. For more information, please click here. Vision therapy is not a treatment option. When light goes through a wedge shaped lens which is called a prism, it bends. Light is also bent when it does not go through the center of a lens. This is an undesirable effect that can occur in glasses. It commonly occurs when the pupillary distance (PD) is not measured or made correctly. Multifocal lenses whose corrective powers change progressively throughout the lens. A wearer looks through one portion of the lens for distance vision, another for intermediate vision, and a third portion for reading or close work. Each area is blended invisibly into the next, without the lines that traditional bifocals or trifocals have. A soft, flexible material that is sometimes used in goggles. The condition Accommodative Excess/Spasm causes an individual to experience blurry distance vision after prolonged near work such as reading or using a computer. The individual may appear to be nearsighted (myopia). Treatment options may include prescription lenses and/or vision therapy. Triangular-shaped fold of tissue on white of the eye. May eventually grow over part of the cornea. May be caused by irritation from sun, dust and wind. Droopy upper eyelid, causing the eye to remain partially closed. A home-based computerized perceptual therapy program, which was designed to enhance visual information processing. The therapy procedures address simultaneous processing, sequential processing and/or speed of information processing. This computer program contains 6 activities that are specifically for the following problems: a weakness with visual information processing skills such as figure-ground, form constancy, spatial relations, visual closure, visual discrimination, visual memory, and visualization skills, slow speed of information processing, and acquired brain injury with perceptual-cognitive deficits. This program is available only from a licensed eye care practitioner. The opening at the center of the iris of the eye. It contracts (dilates) in the dark and when the eye is focused on a distant object. The distances between the pupils of the eyes, in millimeters — a necessary measurement for proper lens prescription. The automatic contraction or enlargement of the pupil when confronted with the presence or absence of light, accommodation, or emotional change. A device used to measure the distance between the pupils of the eyes, in millimeters, which is a necessary measurement for proper lens prescription. It also measures the diameter of the pupil. A condition in which the individual’s ability to follow a moving target is inadequate. Vision therapy is an effective treatment option. Measures the eyes ability to follow a moving target. The eye’s ability to smoothly follow a moving target. Surgical procedure where cuts are made in the cornea in a radial pattern, to flatten the cornea and correct myopia. Requires the use of good visual skills, which are distance and near acuity, accommodation skills, binocularity skills (convergence), oculomotor skills (saccadic), peripheral vision, figure-ground, form constancy, spatial relations, visual closure, visual discrimination, visual memory, and visualization. Determines the eye’s refractive error and the best corrective lenses to be prescribed. There are several methods of performing refraction: Retinoscopy, Automated Refractor, and Subjective Refraction. Defects in vision caused by the eye’s inability to bend, or refract light and focus it clearly on the retina. Astigmatism, Hyperopia, and Myopia are common conditions of refractive error, also called Ametropia. A lens’ ability to bend parallel light rays into focus, as measured by power diopters. In general, the greater the curvature of a lens and the greater the difference between center thickness and edge thickness, the higher the index of refraction and the greater its refractive power. Refractive power can also refer the strength of a person’s contact lenses or glasses. Surgery that corrects visual acuity, with the objective of reducing or eliminating the need for glasses and contacts. Includes radial keratotomy, PRK, LASIK, and corneal implants. Functional amblyopia can co-exit with a pathology abnormality. Treatment is possible. Condition characterized by the progressive loss of peripheral vision, usually beginning with night blindness. This technique determines the eye’s refractive error and the best corrective lenses to be prescribed. An instrument called a retinoscope which consists of a light, lens, mirror, and handle, is used to shine light into a patient’s eye. There are two types of retinoscope: streak and spot retinoscope. When light is shone into patient’s eye, the light is reflected back (‘reflex’). If the reflection is in the same direction (‘with movement’) of the retinoscope then the refractive error is hyperopia (farsightedness) and a plus lens is prescribed. If the reflection is in the opposite direction (‘against movement’) of the retinoscope then the refractive error is myopia (nearsightedness) and a minus lens is prescribed. The strength of the prescription is determined when the pupil is suddenly filled with light (‘neutralized’) with the appropriate lens powers (strength). There are other types of retinoscopy such as Static retinoscopy or Dynamic retinoscopy. Type of contact lens made of breathable plastic that is custom-fit to the shape of the cornea. RGPs are the successor to old-fashioned hard lenses, which are now virtually obsolete. A receptor cell which is sensitive to light and is located in the retina of the eye. It is responsible for night vision (non-color vision in low level light). The eye’s ability to direct and coordinate movement as it quickly and voluntarily shift from one target to another. A condition in which the individual’s ability to scan along a printed page and move his eyes from point to point is inadequate. Symptoms include frequent loss of place while reading, skip or transpose words, and have difficulty comprehending because of an inaccurate eye movement. Vision therapy is an effective treatment option. Measures the eyes ability to move quickly and precisely from point to point. The white protective covering of the eye. This instrument can examine ocular tissue from the front of the cornea to the back of the lens. A narrow “slit” beam of very bright light produced by a lamp. This beam is focused on to the eye which is then viewed under magnification with a microscope. A joystick control is employed to enable instrument to be moved left-right and up-down. A chin rest, head rest and fixation target is also required. Some slit lamps have a tilting mechanism to enable the lamp to be directed from different angles. An ophthalmic lens with no cylindrical power or addition. It has the same power in all parts of the lens. To be unable to direct both eyes simultaneously toward a point. Also known as strabismus (turned eye). For more information, see “Strabismus”. The ability to perceive a three dimensional depth which requires adequate fusion (union) of the images from each eye. Measures depth perception that is dependent on the accuracy of eye teaming. (clinical condition) turned eye (s), the eyes are misaligned. It is caused by a reduction in visual acuity, reduced visual function, high refractive error, traumatic brain injury, oculomotor nerve lesion, or eye muscle injury. In strabismus, the eyes send conflicting images to the brain, and the brain cannot combine these images as it would in normal vision. The brain compensates by ignoring one image in favor of the other, causing a loss of depth perception. Strabismus in more common in children, and affects four percent of all children (although it may also appear later in life). * Unilateral strabismus: Strabismus in which only one eye deviates. * Alternating strabismus: Strabismus in which the deviating eye can change. * Intermittent strabismus: Strabismus which is not present at all times. * Constant strabismus: Strabismus which is present at all times. * Periodic strabismus: Strabismus which occurs at one testing distance but not at another. Named after the optometrist who originally described it, Dr. John Streff. This functional vision loss is also known as Non-Malingering Syndrome. Signs include reduced visual acuity in both eyes at distance and near. The visual acuity at near is more reduced than the distance acuity. Frequently patients will have reduced stereopsis, large accommodative lag on dynamic retinoscopy, and a reduced visual field (tubular or spiral field). The syndrome is associated with a visual or emotional stress occurring in the child’s life. It is more prominent in girls (ages 7-13) than boys. Treatment includes a low plus lens and/or vision therapy. This condition is sometimes incorrectly diagnosed by doctors as hysterical amblyopia. The cornea’s middle layer; it consists of lamellae (collagen) and cells, and makes up most of the cornea. A blocked gland at the edge of the lid which has become infected by bacteria. A blood spot on the eye. It occurs when a small blood vessel under the conjunctiva (the transparent coating that covers the inner eyelid and the white of the eye) breaks and bleeds. A common condition caused spontaneously from coughing, heavy lifting, or vomiting. In some cases, it may develop following eye surgery or trauma. It tends to be more common among those with diabetes, hypertension, and taking blood thinners (including aspirin). A subconjunctival hemorrhage is essentially harmless. The blood naturally absorbs within one to three weeks and no treatment is required. If a mild irritation is present, artificial tear drops can be used. You can speed up the healing process by applying cool compresses for the first two days and then warm compresses in the following days. The procedure in which the patient is asked to report on which lens combination provides the clearest vision. While this is the method of choice for determining prescription in those able to understand the task and respond to the examiner, it is less reliable in children. When the brain ignores the image that is seen by one eye. It is the result of weak eye teaming skills (binocularity). Determines if there is any tendency for the visual processing center of the brain to ignore or suppress visual data from one eye. Membrane of fibers (zonules) that holds the eye’s lens in place. Pertaining to the sense of touch. A type of metal alloy that is very strong. Eyeglasses made of titanium are lightweight, durable and often hypoallergenic. An instrument that measures the pressure within the eye, which is known as intraocular pressure (IOP). A lens design with two different optical powers at right angles to each other for the correction of astigmatism. Red/green targets used with red/green glasses to develop eye teaming skills. A lens design that has three focal areas: a lens for close work or reading, a lens for mid-distance viewing or arm’s length, and a lens for faraway viewing or driving. The invisible part of the light spectrum whose rays have wavelengths shorter than the violet end of the visible spectrum and longer than X rays. UVA and UVB light are harmful to your eyes and skin. Middle layer of the eye, below the limbus, and consisting of the iris, ciliary body and choroid. A three-dimensional picture that is used to strengthen the binocularity system. Available in fixed and variable styles to provide base-in and/or base-out training. 3D glasses are used to view the picture. To turn the eyes horizontally (convergence- inward or divergence- outward). Accommodative vergence, fusional vergence, proximal vergence, and tonic vergence are needed to maintain single vision. A measure of the ease and speed of the eyes to change from a converging to diverging position. A disordered state in which the individual is dizzy or feels that the surrounding environment is whirling. Records and measures eye movements while an individual reads. The system also measures reading efficiency. Specially created goggles and a computer program are used. The ability to take in information through our eyes and process the information so that it has meaning. * Please note that there are some individuals that call themselves vision therapists, but they are not optometrists or vision therapy technicians. Refers to figure-ground, form constancy, spatial relation, visual closure, visual discrimination, visual memory, and visualization. The ability to identify or recognize a symbol or object when the entire object is not visible. The ability to discriminate between visible likeness and differences in size, shape, pattern, form, position, and color. Such as the ability to distinguish between similar words like “ran” and “run”. Difficulty with figure-ground, form constancy, visual closure, and visual discrimination. Symptoms include confusion with similar objects, words, or colors. Vision therapy is a treatment option. Difficulty with retention, recall, or recognition of things seen. Symptoms can include poor spelling and poor recall of visual information. Vision therapy is a treatment option. The inability to process and reproduce visual images by writing or drawing. Symptoms can include poor pencil grip/writing, poor organization on written page, poor copying/spacing, and excessive erasing. Vision therapy is a treatment option. After visual data is gathered, it is processed and combined in the brain with information from movement (eye hand coordination). The ability of our eyes to guide our hands (eye hand coordination, visual-motor integration). Route of the nerve impulses from the retina along the optic nerve, and optic nerve radiations to the brain’s sensory cortex that is located at the base of the skull. The ability to organize and interpret information that is seen and give it meaning. These information-processing skills include figure-ground, form constancy, spatial relations, visual closure, visual discrimination, visual memory, and visualization. After visual data is gathered, it is processed and combined in the brain with information from hearing (auditory-visual integration), balance (gross-motor/bilateral integration), posture, and movement (visual-motor integration). Ability to recall a sequence of numbers, letters or objects in the order they were originally given. Are accommodation (eye focusing), binocularity (eye teaming), and oculomotor skills (eye movement), which are neuro-muscular abilities that are controlled by muscles inside and outside of the eye and are networked with the brain. The ability to crate and manipulate mental pictures of an object or concept on the basis of past visual experience and memory. Essential in reading and playing sports. A part of the eye between the lens and the retina, containing a clear jelly called the vitreous humor. An instrument designed to present separate images to each eye. Each eye can see independently. Two plane mirrors are joined at one edge at a 90-degree angle and two target holders, one opposite one mirror and the other, mounted on a screw base which, when turned, synchronously moves the targets toward or away from each other. The Amblyoscope, Troposcope, Synoptophore, and the Bernell Mirror Stereoscope are examples of this design. Type of eyeglass frame that curves around the head, from the front to the side. Wraparound sunglasses tend to offer extra sun protection because the lenses usually wrap as well. A wedge-shaped lens which is thicker on one edge than the other. The prism bases (thicker end) are in the same direction for both eyes (up, down, left, or right). Yoked prisms are used to train or compensate for a binocular dysfunction (eye teaming problem) or a visual field loss. Sometimes used in optometric vision therapy programs.